A petition is calling for the removal of a Philadelphia church's live nativity scene after its resident cow escaped twice in one day to roam city streets. 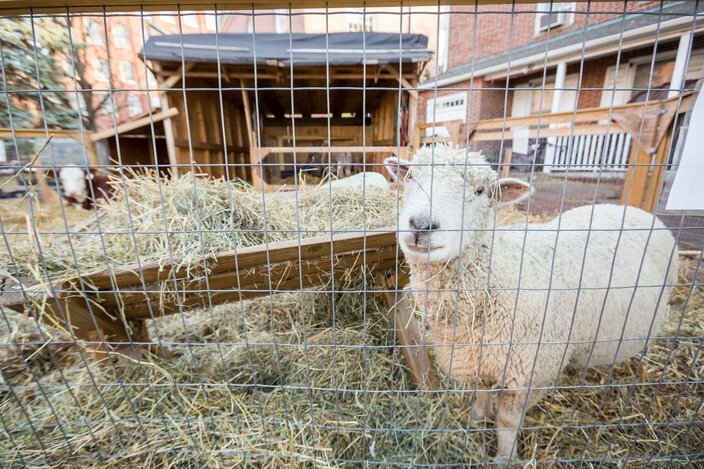 The petition, which has more than 50,000 signatures as of Thursday afternoon, calls on Old First Reformed United Church of Christ in Old City to free its new cow and end the decades-old tradition, which includes other farm animals for a reenactment of baby Jesus' birth. "She clearly has no interest in being used in this way," wrote the petition's organizer Lacey K. "As a Philadelphia citizen, I am apalled (sic) that a local church would use animals in this way." Stormy the cow broke free in the wee morning hours of Thursday, Dec. 14, and was nabbed by police heading south on I-95 near Callowhill Street around 2:15 a.m.
She was returned to the church at 4th and Race streets, but again slipped away and wandered Old City — even making her way to the top floor of a parking garage — before once again being caught and brought back to the church. Stormy has since "returned to the farm," according to the church, and has been replaced with a smaller, more manageable bovine: Ginger. The petition asserts there are better ways to celebrate the holiday season than "exploiting animals." It claims the animals are in danger, since Stormy got onto the highway and could have been hit, and that public resources were wasted on Stormy's rescue. "All of this is meant to be essentially a tourist attraction for families," the petition reads. "But I don't think that animals should be used as entertainment in this way." 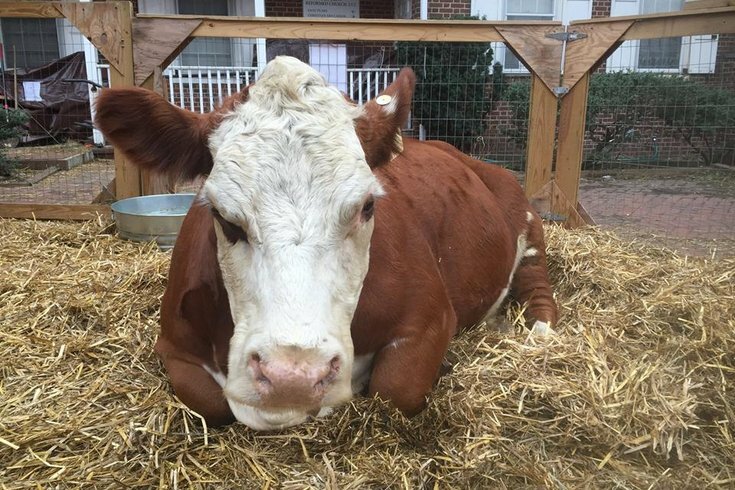 Asked about the petition, pastor Michael Caine forwarded PhillyVoice the church's original statement issued after Stormy's escape, which thanked public officials for making sure the cow returned safely. "Old First's live nativity has been a Philadelphia holiday tradition since 1973," the statement reads. "We take seriously our responsibility to care for these beautiful animals, and work closely with the farmer who supplies them to ensure their safety and well-being." The live nativity at the Old First Reformed United Church at 4th and Race streets has been a tradition since 1973. You will be able to visit the animals this year until Dec. 27. Caine said Stormy was chosen for the nativity scene because since she had been on display so many times before, she's "a pro" and doesn't notice much commotion. After the escape, however, the church decided she "had had enough commotion and deserved to get back to the pasture on her farm." He encouraged Philadelphians to stop by and visit the nativity scene, which will be up through Dec. 27, but declined to comment on the petition, specifically. "While we appreciate the passion and civic engagement of the petition originator and its signers, we have no further comment at this time," Caine said.